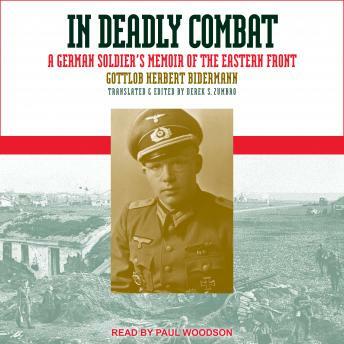 Wounded five times and awarded numerous decorations for valor, Gottlob Herbert Bidermann saw action in the Crimea and siege of Sebastopol, participated in the vicious battles in the forests south of Leningrad, and ended the war in the Courland Pocket. In his memoir, he shares his impressions of countless Russian POWs seen at the outset of his service, of peasants struggling to survive the hostilities while caught between two ruthless antagonists, and of corpses littering the landscape. He recalls a Christmas gift of gingerbread from home that overcame the stench of battle, an Easter celebrated with a basket of Russian hand grenades for eggs, and his miraculous survival of machine gun fire at close range. In closing he relives the humiliation of surrender to an enemy whom the Germans had once derided and offers a sobering glimpse into life in the Soviet gulags.